16pp., 8vo. Complete publication, unstapled and unbound. Unopened (i.e. with the pages unseparated). On the usual high-acidity newspaper stock, brittle and aged, with chipping to outer margins. The first page carries a poem title 'Ireland, 1914', by Padraic Colum. Other contributors include Joseph Plunkett and Professor T. M. ('Tom') Kettle. 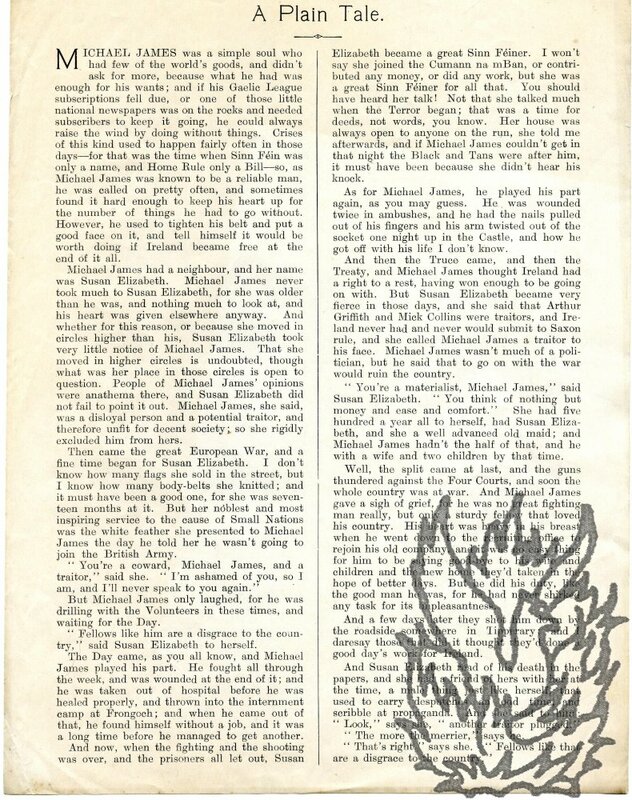 The final page carries an article by M. J. Judge titled 'A Nation's Destiny. Arms Are The Arbiters', and an illustrated piece on 'First Aid'. The newspaper was published between 1914 and 1916. 'Printed for the SINN FEIN Printing and Publishing Company, Limited, by An Clo-Cumann, Teo., 68-71 Great Strand Street, in the City of Dublin, and Published at the Office, 17 Fownes Street'. 27 February 1909. 4pp., folio. Broadsheet bifolium. On aged high-acidity paper, folded once vertically, and once horizontally, and with wear along the fold lines. Lynd's article is the main one on the front page, covering 74 column inches across five of the seven columns. The article begins: 'I do not know what exactly can have been in my mind when I gave "Literature and Politics" to the secretary of the Irish Literary Society of London as the subject of a paper I had promised to deliver. 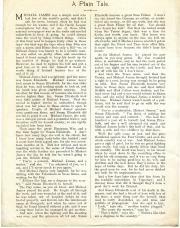 Copy of the Irish republican newspaper 'Saoirse na h-Éireann. Irish Freedom', from the papers of Robert Lynd, and with the front-page article 'Germany is not Ireland's Enemy' possibly written by him. 'Printed by Patrick Mahon, 3 Yarnhall St., Dublin, for the Proprietors and published by them at their Office, 12 D'Olier Street, Dublin.' September 1914. 8pp., folio. Unopened. On aged high-acidity paper, with wear along central vertical fold, and chipping to extremities. The article is unsigned, and covers the whole of the front page and p.5 (which is headed 'Ireland won't be fooled again.') and ends on p.6. An inflammatory piece of writing, as the following paragraph indicates: 'Good-bye, Tommy! | Firstly, the army of occupation has been taken from Ireland. Dozens of ships were steaming in and out of Dublin Bay for a week, taking away the men who held this country for England before Mr. Redmond offered Mr. Copy of the Irish Republican newspaper 'Sinn Féin', from the papers of Robert Lynd, and possibly containing an article by him. 'Printed for the Sinn Fein Printing and Publishing Company, Ltd., by Devereux, Newth and Co., 49 Middle Abbey Street, Dublin, and published by the Sinn Fein Company at the same address.' 27 July 1912. 8pp., folio. On aged and creased high-acidity paper, with closed tears and chipping. The two articles most likely to be the work of Lynd are 'The Viceregal Microbe' on pp.2-3, and 'The Future of the Language Movement' on p.2; both are anonymous. (Baile Átha Cliath: An Cló-Chumann, ). An Cúigeadh Árd-Chomhairle De Sinn Féin A Tionólfar 1 Nárus Na Príomh-Chathrach, Ar Diardaoin, Lughnasa 26ADh, 1909 [The fifth Central Council [Meeting] of Sinn Féin to be held in the City Hall of the Capital on Thursday 26 August 1909.] . Pamphlet, 12pp, 12mo, grey printed wraps, fair condition. Signed in type at end: Aindrias Ua Broin, General Secretary.’, In pencil (N.F. Dryhurst’s hand? – anarchist, suffragette, Irish patriot, etc.] at head of front wrap: ‘Please return keep for me’. Typewritten draft of circular letter, with corrections, appealing for support for Griffith’s Sinn Féin newspaper, and giving details concerning its foundation. Typescript, 3pp, 4to, good condition. Author and recipient not stated. Undated, but from the context written in 1906. It begins, We desire to bring under your notice the following facts respecting the Sinn Fein daily newspaper’ and says that Griffith and the directors stated that ‘a sum of £8000 was required for the purpose’, but that [t]he sum of £3300 only was subscribed in answer to the appeal. [viii].91pp., 8vo, beige printed wraps, worn, sl. sunned, marked, chipped corner at back, discreet repairs to spine and edges, contents good. Scarce.